Ah, the glorious feeling of having a house entirely to oneself after sending all the chicks in your nest off to their first day of a new school year! 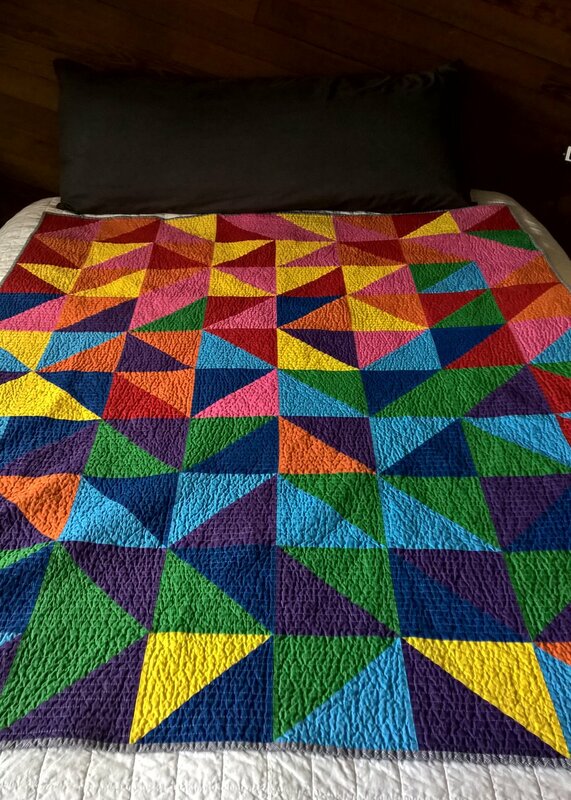 Keeping those vibes going by sharing my most recent quilt finish: "Back-to-school" a vibrant, technicolor version of my "Chance of Showers" quilt using the ombre HST tutorial found here. When I was trimming HST, I glanced into my wastebasket and the trimmings left me with the impression of colored pencil shavings, making me think of school supplies and freshly sharpened pencils. In that moment, I knew this quilt was destined to be gifted to a dear friend of mine who is a teacher on her first day back-to-school! If you follow me on Instagram (BranchVineHandmade), you've seen me tracking my progress in making this quilt. As a maker who gifts and sells many of my makes, I'm often asked how much time it took to make an item. To this question, I usually blush profusely and stammer something along the lines of "Oh, a while I guess...". While I do tend to feel a bit shy admitting how long a project took, I found that I don't actually have a good grasp on the amount of time involved in a project. I am able to determine the number of weeks it took me to complete a project, but I don't have a realistic understanding of the total TIME of a project. As a maker who sells, I felt having this info would help me in pricing my goods (something I struggle with). 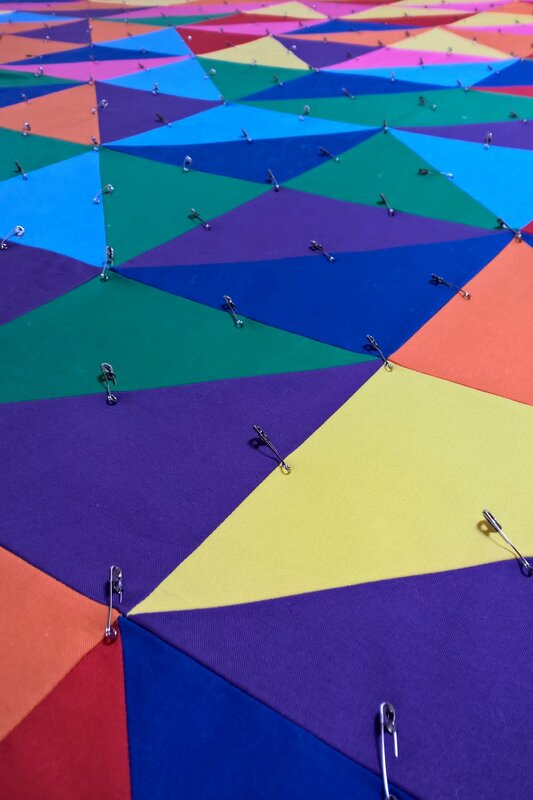 To encourage would-be makers who feel they don't have enough time to commit to quilting to show how much time is involved in a project and how I personally break that down into manageable chunks. In the world of social media, it can feel like makers just whip up these amazing creations effortlessly (and daily!) which can be discouraging when you're staring at a project you've been working on for weeks and don't see the end in sight. I wanted to show the PROCESS and acknowledge the real time it takes to create. Some of us have more time than others in a given day (or week) to devote to our craft, but the total time spent sewing is similar. Machine quilted in straight lines 1/2" apart in cream thread (Gutterman 800) - 7 bobbins worth! Measurements (before washing): roughly 56"x70"
Halfway through the process, I was having mixed feelings about this quilt. I was really questioning my use of the Kona Kumquat; it was reading a little muddier than I would have liked. I pushed on however, and I felt that the quilting really redeemed this quilt for me. The dense straight line quilting made the seams disappear and I loved how all the HST ran together in an unbroken feel. The cream color of the thread helped the orange feel brighter and more candy-colored, which was the look I was hoping for. Normally, I use pieced quilt backs as I am of the school of "make-do-with-what-you-have". However, for my last few quilts I've treated myself to wide backing fabrics, and it's truly delightful to skip the step of piecing the back! I have chosen low volume wide fabrics so that the leftover backing fabric will have a place as a stash staple to be used in piecing future quilt tops. And now for a quilter's PSA. I always wash my quilts before gifting or selling, ALWAYS. I don't prewash my quilting fabric because I like the sizing when I am cutting and sewing. I use several Color Catcher sheets in the wash cycle and I wash using warm water. Basically, I treat the quilt as I would expect the recipient to, and I want to know how the quilt will behave. That being said, Kona Citrus picks up color bleed from other fabrics better than Color Catchers... UGH! I was able to pull out most of the color bleed because I examined the quilt after washing and before drying and then running the quilt through 3 more wash cycles (with more Color Catchers) and spraying affected areas with stain spray. I think the affected areas look good now and would only be detectable by my critical eye. Interestingly, my light backing fabric didn't pick up any color bleed... go figure. And now I'm heading back to my machine to keep alive my tradition of sewing myself a new shirt on my kids' first day back to school. How I miss my kiddos, but how I enjoy some uninterrupted sewing time!